When I think of the word Cougar two things come to mind, a wild cat, and a desirable older woman. Both are beautiful, fierce, strong, and have a dominating character. It makes complete sense to me why a well known, cutting edge, new age company like OGIO would name their newest 2009 women’s cart bag Cougar. The OGIO Cougar Cart Bag is a thing of beauty. It has clean lines and strong features just like the feline Cougar and it has presence and elegance, like the female Cougar. If I had to judge the bag on looks alone it would get an A+, but looks don’t mean everything when it comes to a golf bag. The most important feature most people consider when picking the right bag is â€œhow functional is it?” Well I am pleased to report this bag has it all. The very first thing I noticed about the bag was that every compartment was labeled for ease of use. There was no more wondering â€œwhat is this pocket for?” or wondering where you put a certain item, now everything has it’s place, and I just love that. It even has a spot to hold your score card and pencil, it’s genius! 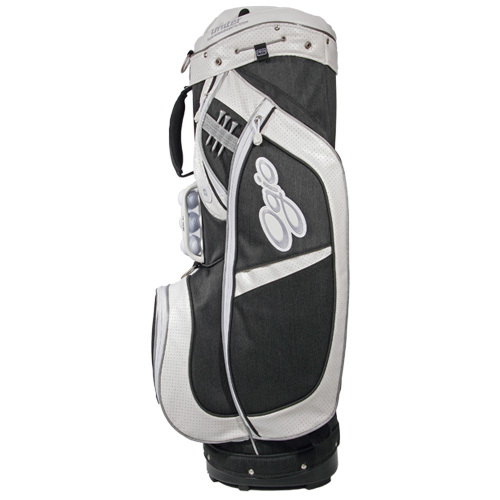 The bag itself features a 10″ 15 way Uniter top for the comfort and safety of your clubs. It also has a a full length umbrella compartment and a shoulder strap with a stash pocket. The pockets for your valuables are lined in fleece and it also has additional compartments for further storage. There are actually 6 extra pockets and they are all facing forward to allow for easy accessibility while on the golf cart. The Cougar cart bag has left nothing out, they have a Ball Silo that can hold up to 3 balls, so if you hack a ball into the water, no need to dig through your bag for another one, just pull one out of the silo and do like I do call a mulligan. Need a towel to clean off your clubs, no problem just hook one on to the oversized towel loop. 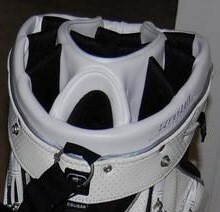 As mentioned above, OGIO did not miss a single detail, if there is a feature a golf bag needs, the Cougar has it. The attention to detail and sheer beauty of the bag puts it at the top of my Must Buy list. However, the function and features of this bag are what really sets it apart from the rest. The Cougar is offered in three different color choices, brown/plaid, white/plaid, and lavender. No matter which color scheme you chose you cannot go wrong with the OGIO Cougar cart bag and with a price tag of $160 USD, your wallet, eyes, and golf clubs will thank you. 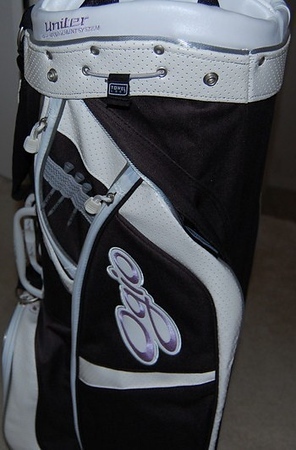 You can find this bag and any other OGIO product on their website at OGIO. I must have this golf bag. After all, I am a cougar. Cool bag. I like the color patterns they offer. Especially the plaid. I actually use this bag and have for a little while now. I came from a Nike bag before this and all I can say is it is perfect. By far the best bag I have used and the reviewer did a great job of trying to convey that. I have the plaid one as well. Just ordered one for my wife this morning. Thanks for the heads up on these. Very nice looking. Great Post! This a excellent looking and well designed bag. Any woman will be happy to have this one. Great job Ogio!